The Pentax 3.8-5.9mm f3.7-4 08 Wide Zoom Lens with ultra-lightweight and compact design is the perfect companion for on-the-go snapshots. This pocketable lens offers a focal range of 17.5mm to 27mm (in the 35mm format) when mounted on the Pentax Q7 and is great for taking landscapes, architecture, street photography and group shots. 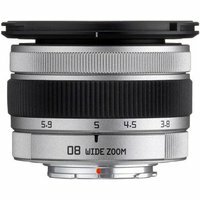 The lens features an inner-focus mechanism for high-speed, low-noise auto focus operation for smooth and discreet shooting. The DSA (Dual Super Aspherical) and ED (Extra Low Dispersion) glass elements enjoy reduced chromatic aberration for clear, high resolution images with edge to edge sharpness.